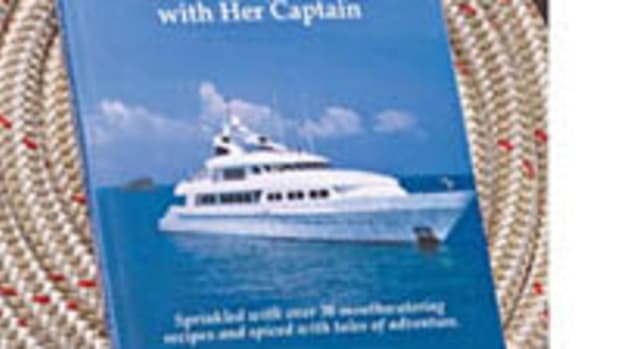 There was something for everyone in the electronics hall at the Miami boat show, at prices to suit almost every budget. In Miami, my personal pick of the show is the TracPhone V3 mini VSAT terminal. Less than 15 inches in diameter and weighing just 25 pounds, KVH is claiming it as the smallest marine VSAT antenna in the world—and pointing out that its size, weight, and price are all smaller than an Inmarsat FleetBroadband 500 system, despite offering broadband data downloads at 2Mbps—four times faster than FB500 can achieve. VSAT has always been great for serious, high-volume users, but many pleasure boaters—even those who haven’t been discouraged by the high capital cost of he equipment—have been put off by high up-front monthly costs and complex airtime agreements. With a price tag of $16,995, the TracPhone V3 still isn’t satcom for everyman, but those who can face the up-front cost will be rewarded with KVH’s simple worldwide pricing packages starting at $49 per month for 50 MB of data and telephone calls to and from anywhere in the world for $0.49 per minute. That’s about half the price of FleetBroadband for voice, and about a tenth of the price for data. Safety always seems to be a hot topic, but there appeared to be even more new safety products this year than usual, including the introduction of a complete range from a brand-new British company called Ocean Signal, including four different EPIRBs, a SART (search-and-rescue transponder) and—awaiting FCC approval—an emergency VHF radio. 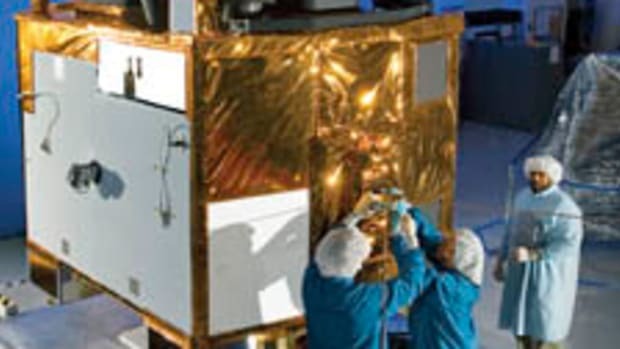 The EPIRBs all look identical: They are the typical “ice cream cone” shape, in safety yellow, and they all operate on the international satellite distress frequency of 406 MHz but they are available with or without integral GPS and with or without automatic “float free” brackets. 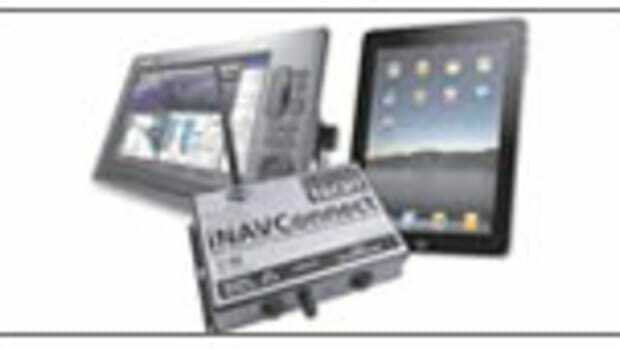 Prices range from $519 for the non-GPS, manual-release version to $929 for the GPS float-free model. The thing that sets all four versions apart from most other EPIRBs is that their batteries are user-replaceable—a significant savings in five years’ time, when a conventional EPIRB would have to be sent away to an approved service facility for a new power pack. Of course, Ocean Signal isn’t the only company to have realized that setting recreational users free of the compulsory servicing routine that is imposed on commercial shipping could give them an important edge: Their long-established rivals Kannad launched a range of user-serviceable EPIRB’s last year. This year, Kannad has come up with two even more innovative products. The first is the Safelink Solo—a Personal Locator Beacon (PLB) that uses the same no-fee satellite system as a full-sized EPIRB, and includes a built-in GPS to take the “search” out of search-and-rescue, but does it all in a fist-sized unit that is less than 4.5 inches long, that weighs a shade under 6 ounces, and whose list price is $280. 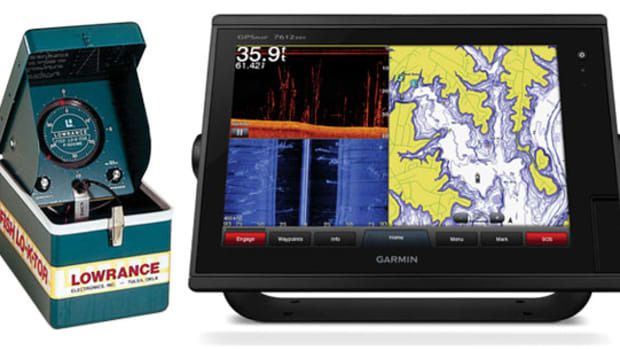 Topping the list of new sonars were Garmin’s GSD 24 and GSD 26—rather coyly described as “two new black-box digital sonar solutions.” In fact, while that’s a perfectly fair description of the $700 GSD 24, it doesn’t do full justice to the GSD 26, which is priced at $2,000 (plus several thousand more for a suitable transducer!). Like Simrad’s BSM-2, introduced at the end of last year, (see PMY December 2010) the GSD 26 breaks away from the traditional fishfinder technology. 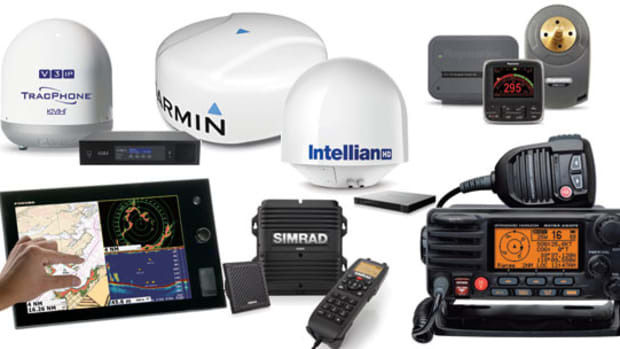 Simrad called it “broadband” and Garmin calls it “spread spectrum,” but whichever name you prefer, the point is that both are using ultra-long “chirps,” sweeping across a range of frequencies instead of short pulses on each of two or three separate frequencies. The performance claims made for the GSD 26 are almost identical to those of the BSM-2: Pictures as clear and sharp as you might expect in 100 feet of water or less, but at depths down to 10,000 feet. At what could be described as the other end of the sonar spectrum, Si-Tex has introduced another of its back-to-basics instruments in the shape of the SDD110. 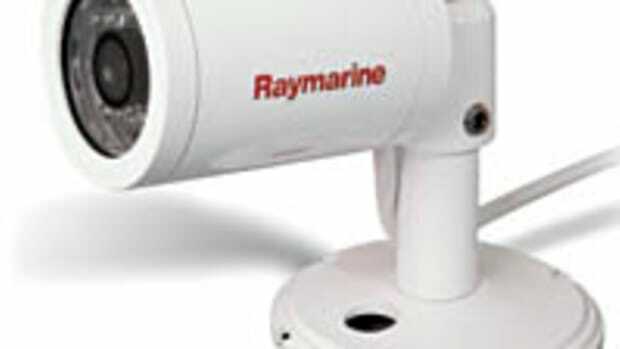 Intended mainly as a drop-in replacement for the once popular Datamarine sounder, it’s a digital depthsounder whose 120 kHz transducer plugs straight into the back of the display unit for straightforward installation, at a painless list price of $349.